Bass fishing e-books are a great way to discover and learn about the methods and techniques of fishing and catching smallmouth and largemouth bass. An excellent written e-book about bass fishing can provide a lot of valuable information to help one become a better bass fisherman. It may be best to keep an open mind when choosing an ebook on bass fishing. Some of these bass ebooks may claim to let you in on the secrets for landing countless numbers of fish. But really, it's only a secret if you don't already know about it, right? 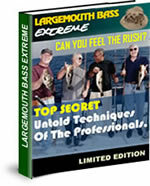 So, a highly experienced or pro bass angler might already know how to successfully catch limitless amounts of bass. Therefore, a bass fishing ebook would probably be best suited for a beginner bass fishing enthusiast. Yet, that's not to say that an experienced bass man or woman would not be able to benefit from some of the cool tips, tricks and tactics found packed within the material of the ebooks. 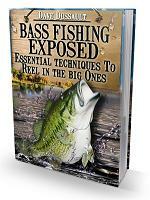 We have researched and reviewed through a compelling amount of ebooks on bass fishing. The following ebooks which you see below are some of the ones we have hand picked that you may find interesting. Also see our top picks for physical hard copy bass fishing books here.